David Keefe (’20SPS, Narrative Medicine) joined the armed forces immediately after 9/11 and served as a marine in Iraq. After detaching from the armed forces, he grew concerned about the well-being of veterans who are marginalized for health and sociopolitical reasons, and have no voice or community. The violence of war impacts both veterans and nonveterans in our society. How do we process those shocks? Keefe brings communities together for an artistic process that transforms trauma into new understanding—literally. Participants break down their military uniforms and transform them into paper where new work can begin. He tells us about his incredible journey below, and offers his wisdom to veterans. Why did you join the Marines? I joined the marines 11 days after 9/11. I had these innate values of duty, of service, of patriotism, even glory. But after I returned home from Iraq, I noticed that so many veterans were marginalized and unable to tell their stories. So I, along with fellow veteran artists, began thinking about ways to address that problem. We carry our trauma with us—how can we unpack it with narrative and making? “When veterans come home, many still have the urge to serve,” says Keefe. Was there a particular moment where your perspective on war changed? I had to unpack the trauma of participating in a conflict. Many veterans feel a drive to serve our country and the people we love. Yet war dehumanizes us—and often we become alienated from the communities we wished to protect. In a country with very loud patriotic rhetoric, many veterans can feel silenced and unable to tell their stories of trauma, hurt, betrayal, and moral injury. Despite all of that, when veterans come home, many still have the urge to serve. 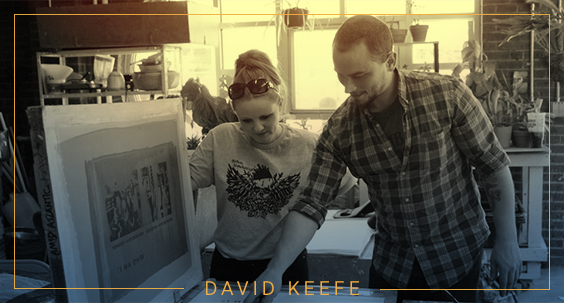 Keefe leads a connective practice that helps veterans address trauma by transforming uniforms into paper. How did that lead into your artistic, connective practice? We need to open up our narratives and learn from each other. That is how we can continue to serve. Some veterans keep the uniforms that we wore during combat. In my practice, we cut the uniforms into little pieces. We smash them, break them down into fibers—literally the connecting threads between the veteran and their memories. We process our narratives, we process our uniforms, transform them into new paper—a place for a new story. Veterans and nonveterans come together for this process. Two strangers with diametrically opposed backgrounds listen to—and see themselves in—one another’s narratives. We transform isolation into connectivity, silence into storytelling, grief and trauma into understanding. Why did you choose the Narrative Medicine program at Columbia? I knew qualitative research into social science and narrative ethics would enhance my practice. I also see myself as an art teacher who operates outside the normal classroom environment, so in the program (and beyond) I plan to study pedagogical theory in-depth. With my faculty and mentors, I’m working towards the next step—an interdisciplinary Ph.D. program in connective practice. 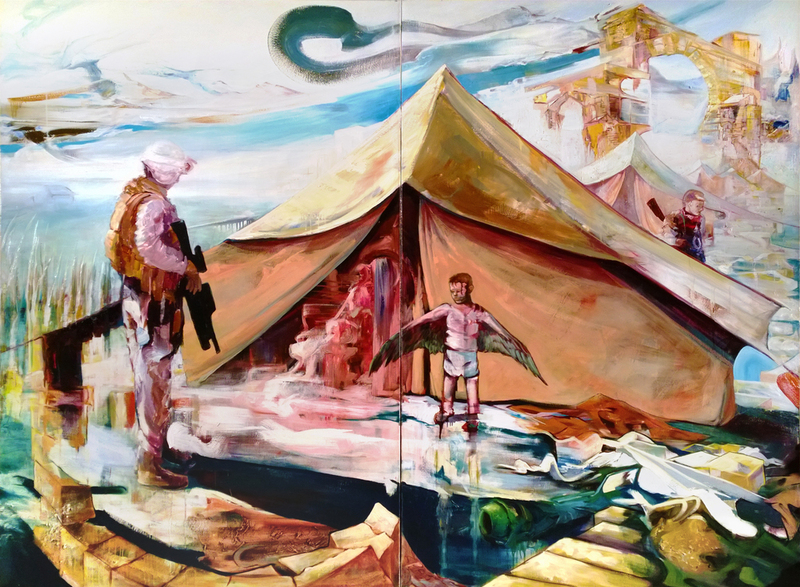 I want to combine an artist’s sensibilities and process of material with anthropology, literature, and medical humanities in order to connect communities through the transformative processes of narrative and artmaking. The Meeting of Dark Scout and Winged Boy, an oil on canvas by David Keefe (2012). What advice do you have for veterans? Tell your story. Find a new creative language to tell your story. I tell mine through papermaking, painting and drawing. Be a little vulnerable, open up. Reach out to your neighbor, offer your experience, and try and find out who they are—whether you’re a veteran or not, be open to finding commonality. We all need to build new communities where we listen to strangers. It’s more crucial now than ever. You’ll be surprised by how much you have in common. 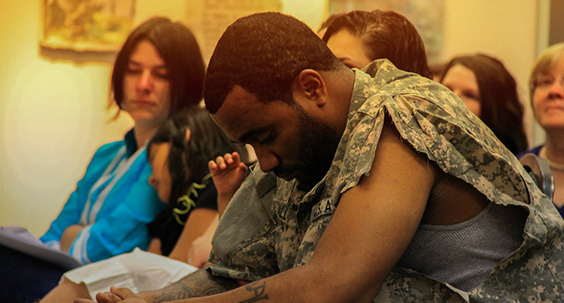 Learn more about the Master of Science in Narrative Medicine program at the School of Professional Studies and visit Student Financial Services for information about benefits and resources for veterans and service members at Columbia University.